ZipRecruiter is a job aggregator, resume search tool, and job search engine. Once an employer posts a job on ZipRecruiter, it’s pushed to 100+ different job boards. ZipRecruiter lets you post from a single platform and captures all the applications in one place, saving hiring managers from posting jobs and filtering through applications from multiple job sites. In this article, we’ll show you how to use ZipRecruiter to simplify your recruiting process. We’ll also provide pricing information to help you determine whether ZipRecruiter is a better option for you than posting your open positions directly on some of the top job search sites like Indeed, Monster, or CareerBuilder. Of course, ZipRecruiter may only be one part of your hiring strategy. You can use an applicant tracking system (ATS) like Freshteam to post your jobs to multiple job boards, including ZipRecruiter, as well as social media sites. Best of all, Freshteam is free for up to 50 employees. ZipRecruiter provides access to over 12M job seeker resumes and posts to more than 100 job boards, so it can be a one-stop-shop for your recruiting and hiring process. When you post a job on ZipRecruiter, it also gets automatically posted on over 100 job boards. Most of these are smaller or niche boards, such as resume.com, job.com, medjobbers.com, truckerswanted.com, and many more. While each of these sites may not get a lot of traffic individually, when added up, you can get a lot of eyes on your job posting. Unfortunately, ZipRecruiter doesn’t post to the biggest job boards like Monster, Indeed, or CareerBuilder. It’s an extra charge to have your job posted on LinkedIn. You can also post your ZipRecruiter job postings on your business’ social media pages, such as Facebook, Twitter, and Instagram. 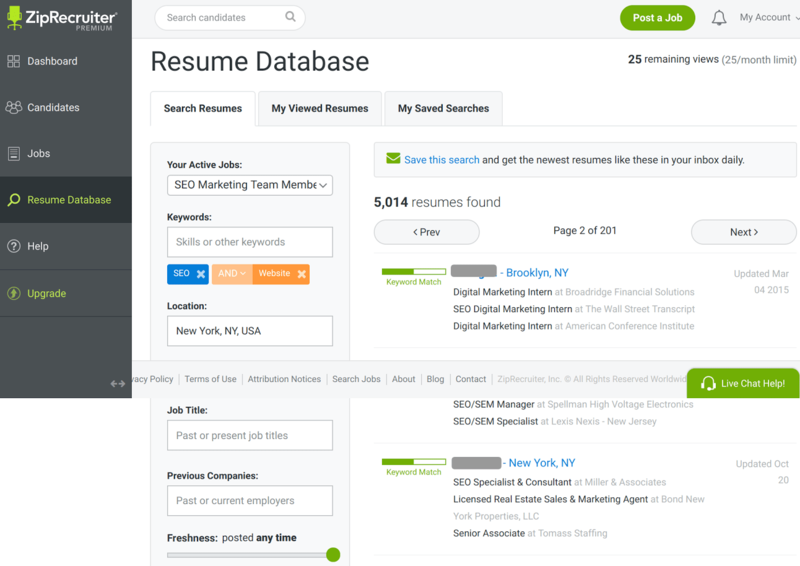 ZipRecruiter has a resume bank of over 12 million resumes, and it allows you to do unlimited resume searches by every kind of criteria you can think of – including keywords, education and location. Using a resume search helps you find job seekers who are passive candidates, meaning they haven’t applied to your position, but might if you contact them. The search is free, but if you want to contact an individual through ZipRecruiter, you have to pay for an account that provides you access to job seeker contact info. We provide more on the resume search feature below. ZipRecruiter has a mobile app, making it easy for job seekers to apply for jobs, which benefits you as you’ll get more applications. Employers also can use the ZipRecruiter app to view, rate and contact candidates from a smartphone. 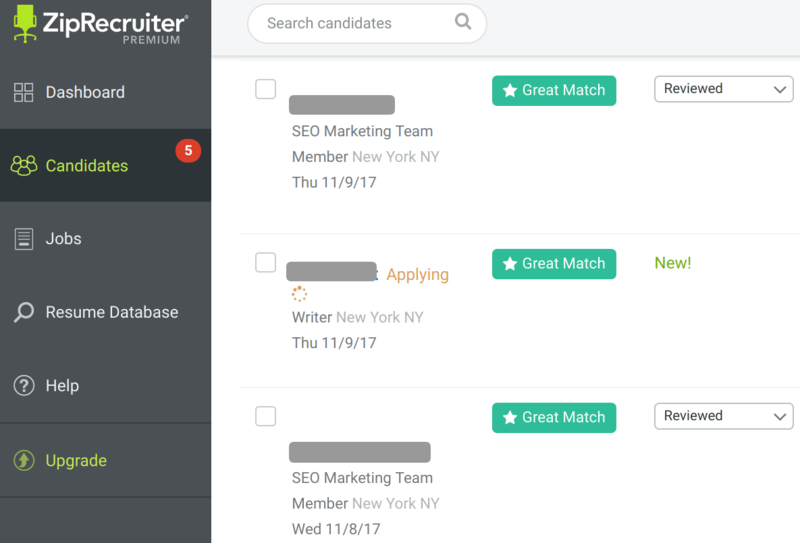 On ZipRecruiter, you can even see where candidates applied from — did they apply via a social media site, a smartphone or from a website? 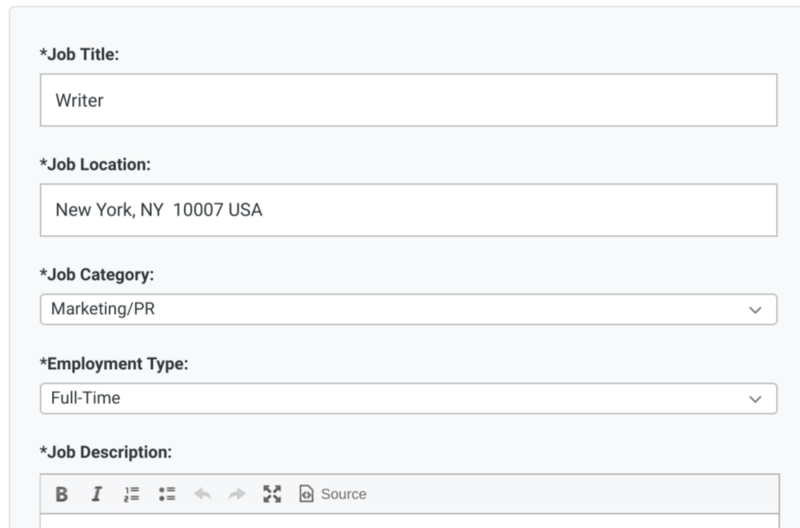 This is a new feature ZipRecruiter recently added that allows you to quickly post all your open jobs to your website without programming skills or big website changes. If you have a business website, you can promote your open positions using the embeddable ZipRecruiter widget. Just copy the code directly to your webpage and voila, you website has a recruiting page. 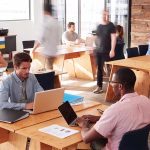 You can set up a ZipRecruiter business recruiting account to be used by more than one person in your office. For example, let’s say you give your office manager access to post and review resumes on ZipRecruiter, but don’t want her to see that you’re posting a higher level job that she may end up reporting to. You can limit her view to see only the jobs postings you allow. The cost of ZipRecruiter ranges between $249 per month to $349 per month for small businesses, based on how many job slots you need. ZipRecruiter has multiple pricing tiers and with each tier you get extra features such as the ability to add additional users to help you post jobs and review resumes, or the ability to contact more candidates. To keep it simple, we provide two tiers below that might work for a small business that needs to post between 1-10 open jobs at a time. We found ZipRecruiter a bit inconsistent in that the pricing shown when you register for an account may not match what’s shown on their pricing page. It appears that they offer different packages depending on the size of the company. 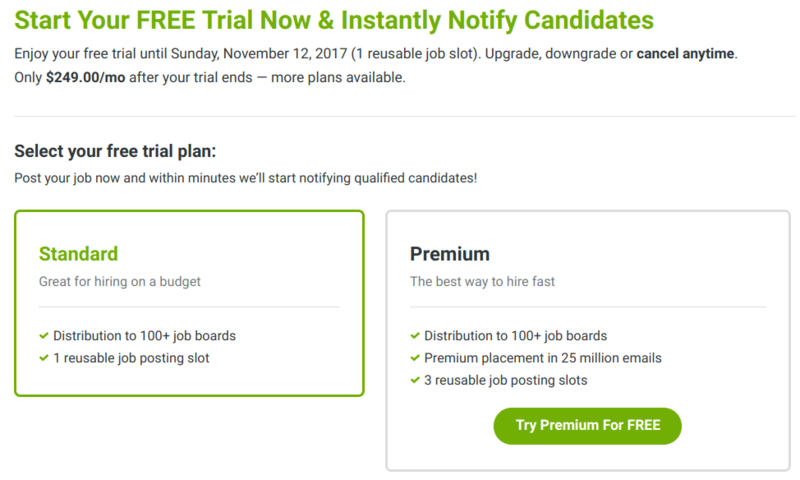 For example, when I signed up for a free trial for a company with 50 employees, I was offered a price of $349 for 3 job slots, rather than $375 for 10 job slots as shown on their pricing page. So I encourage you to do a free trial for your exact size company just to see what they offer before you sign up. Also note that ZipRecruiter doesn’t pro-rate cancellation fees, so if you cancel 1 day after your free trial (which is only 4 days long), or 1 day after the end of the billing cycle, you’ll have to pay for the whole month. Also, if you want to post to a specific job site that’s not included, like LinkedIn Recruiter, there’s an upcharge of $300-500 that depends on the location. For instance, if you want to post a job in New York City to LinkedIn, the charge appears to be $499 for a 30-day posting. You can also pay about that much extra to ‘boost’ your job posting which we’ll discuss more below. You can read more about ZipRecruiter pricing in our ZipRecruiter Reviews & Pricing Guide. ZipRecruiter does provide a free trial, but there’s a caveat. They may advertise it as a 30-day trial, but you need to cancel within 4 days to avoid your credit card from getting charged. As long as you cancel by the 4th day, you can access your account for the remaining period. With the free trial you get the full package features, and can keep any applicant information from job seekers who apply during the trial period. Pay close attention to the cancellation date if you choose the free trial and don’t intend to subscribe. If you don’t cancel before the trial period ends, you will end up paying for the entire month. Use the instructions below to cancel, as the process is not super easy to find online. In this section, we’ll walk you step-by-step through ZipRecruiter’s job posting process so you can see what it is like before you sign up. To keep names confidential, we’ve masked out candidate information on the screenshots. 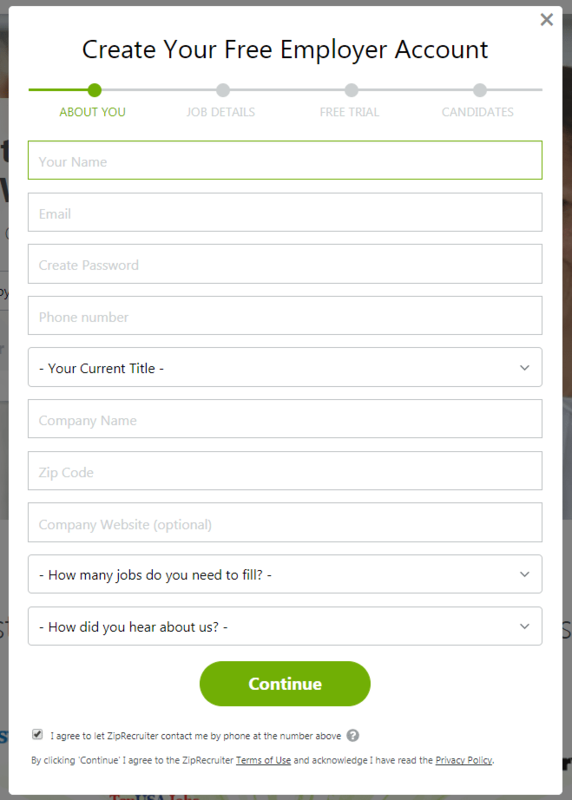 Go to ZipRecruiter.com, and click “Post a Job.” A popup will appear prompting you to create an account. Follow the onscreen instructions to create a ZipRecruiter account. Once you create an account, you’ll see a dashboard, and you can post your first job under the “Jobs” menu. ZipRecruiter allows you to post most jobs except domestic roles such as housekeeper, nanny, or personal assistant. For domestic jobs, you might consider using SnagaJob instead. Here is a link to ZipRecruiter FAQs with information on what kinds of jobs you can post and any restrictions. Input the job title, job location, job category, and type of employment. As far as location, you can put in a full address, or just a zip code–either will work. 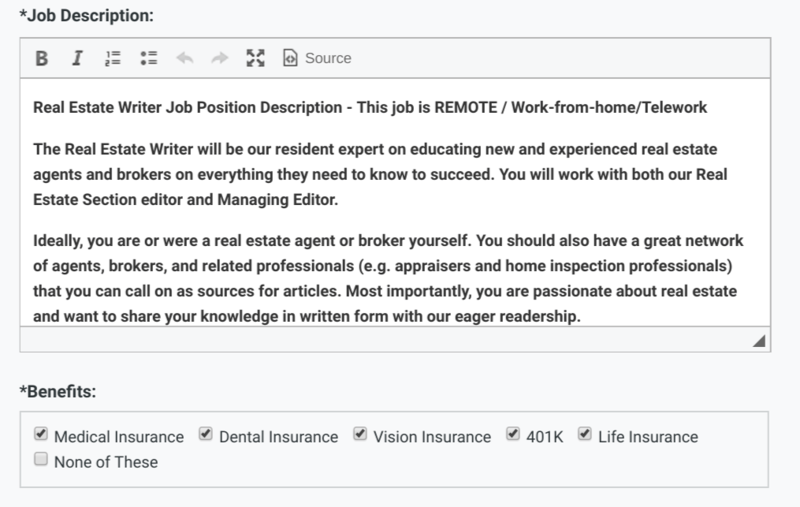 If the job will be remote, you still need to list a company location, but you can add the word ‘remote’ to the job title on your post and put in ‘remote’ as the work address on your post. If you can’t think of a clever job title, read our article on how to come up with a good job title. It’s equally important to choose a title that will get clicked on, as it is to choose a title that is descriptive of the person’s responsibilities. Writing a good job description is important to attract the best candidates. For now, keep your job description short and interesting: list job functions, job requirements, and any required education or certification. But keep it simple, with short paragraphs, clear section headings and bulleted details. Most job applicants don’t read past the first page. In addition, ZipRecruiter lets you select which benefits your company offers — you don’t have to type that information in manually. Just choose from the checkboxes as shown in the screenshot below. Further along in the process, you’ll also get to add company info and even your company logo. Be aware that if it’s a commission only job, those words ‘commission only’ need to be included in the job description section, or ZipRecruiter will flag the posting because they don’t want candidates to think they’re applying for a paid job, when it’s a commission only job. If you’re lucky, ZipRecruiter will already have a similar job description for you to start with as you can see in the screenshot below for a second job we posted. 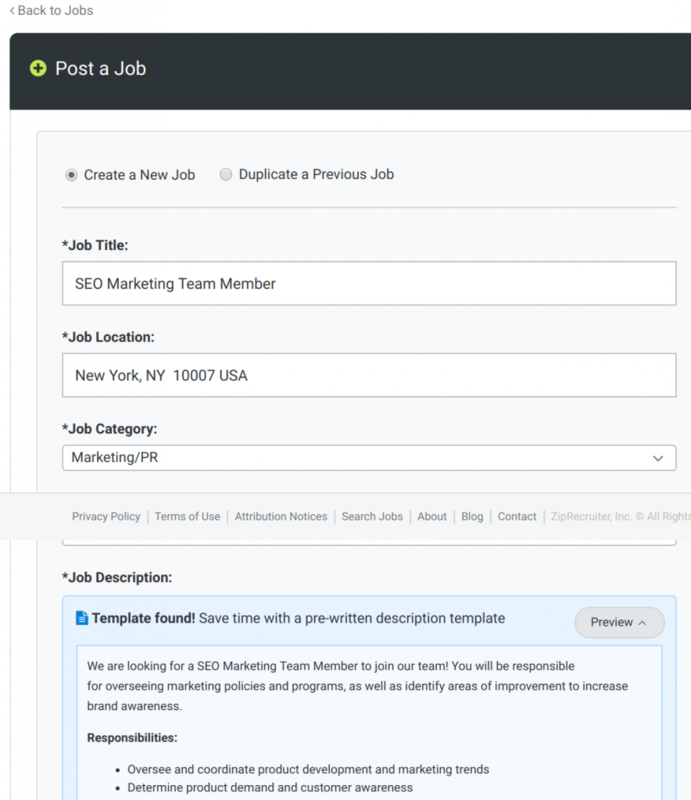 You can accept the template and modify it to customize the posting to fit the specific job opening. Provide a salary range for the position, the work address (city name, zip code, or just a general description such as ‘Ohio’ or ‘work from home’), and then start choosing required skills the candidate should have. Although entering a pay rate is optional, you’ll get better results if you include at least a range. 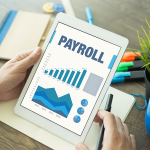 ZipRecruiter offers a graph to show you what similar jobs pay compared to the salary or range your job pays, and provides suggested skills based on your job description. Use their suggestions to revise the pay rate and skills, or you can type in additional skills specific to the job. Next, you’ll come to a section about your company, and this is where you can input information about your firm that will entice job seekers to want to join your company. Provide a little background, tell what it’s like to work there, and if flex time or remote work is an option. This information is posted on every job you’ll post on ZipRecruiter, so you only have to type it in once. Before your job goes live, you’ll need to choose a free trial or paid plan. If you choose the free trial, keep in mind it’s only free for 4 days. You must input your credit card information (even if you choose the free trial), or you won’t have the ability to post your job. The free trial is for the Standard Plan, which only includes 1 reusable job slot. If you are planning to post multiple jobs at the same time, you’ll need to sign up for Premium Plan. Once you input your credit card and finish registering, you’ll get an email confirmation that will tell you exactly how long the trial period is, as well as the exact date and time it ends. Save that email, and if you don’t want to be charged for the monthly subscription, cancel it before your trial period ends. Cancellation instructions have been provided above. The job won’t post until you select the little check box at the bottom. Once you do that, choose the Post My Job Now button, and that’s all it takes. Your job will be posted and you’ll see this pop up on the screen. ZipRecruiter gives you lots of options to increase traffic to your job post, or to encourage passive job candidates to apply to your job. Right after you post your job, you’ll see something like this encouraging you to optimize your job description. 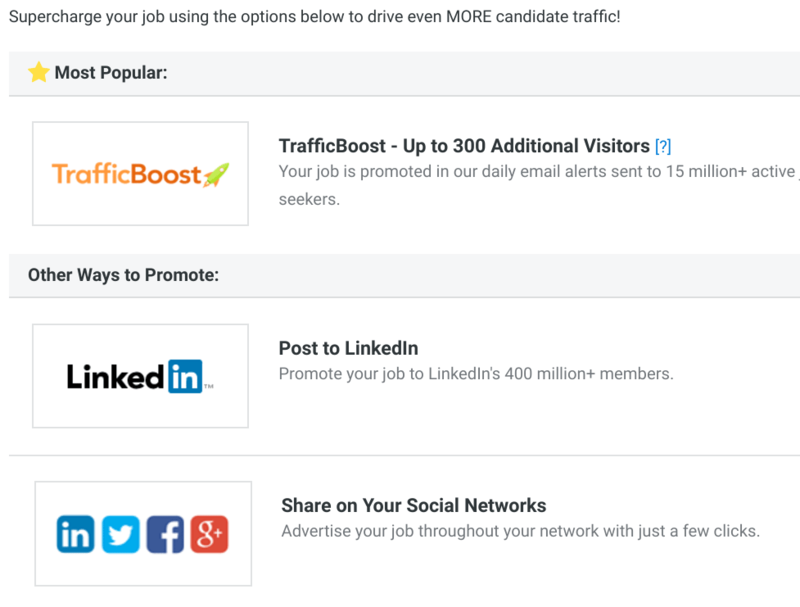 These include things like posting your job opening on LinkedIn for an upcharge, or Traffic Boost, which is an additional advertising service that keeps your job post at the top of the job boards and promotes your job in daily email alerts to job seekers. Traffic boost costs $300-$500 depending on competition in your local area, i.e. it costs more to boost a job in New York, than Peoria. Unlike other job posting sites that let you choose only from a bank of standard questions, ZipRecruiter allows you to add custom questions. 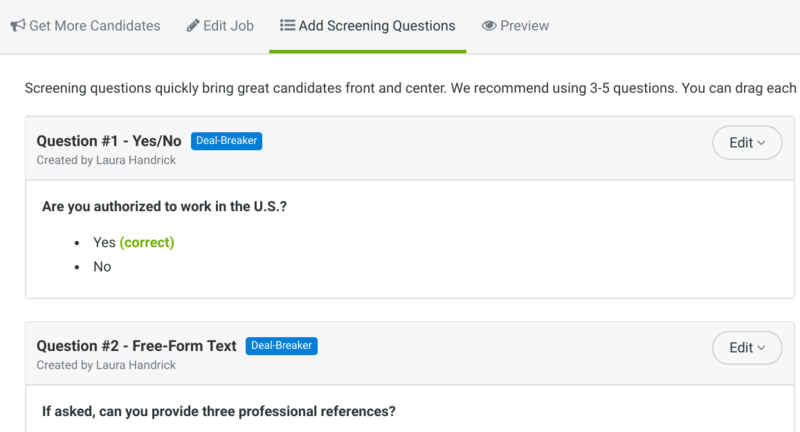 If you’re looking for a candidate with a very specific set of skills, you can post the question and make the answer required. This helps you screen out unqualified applicants and saves you time looking through resumes of job seekers who aren’t likely to be a good fit for the job. 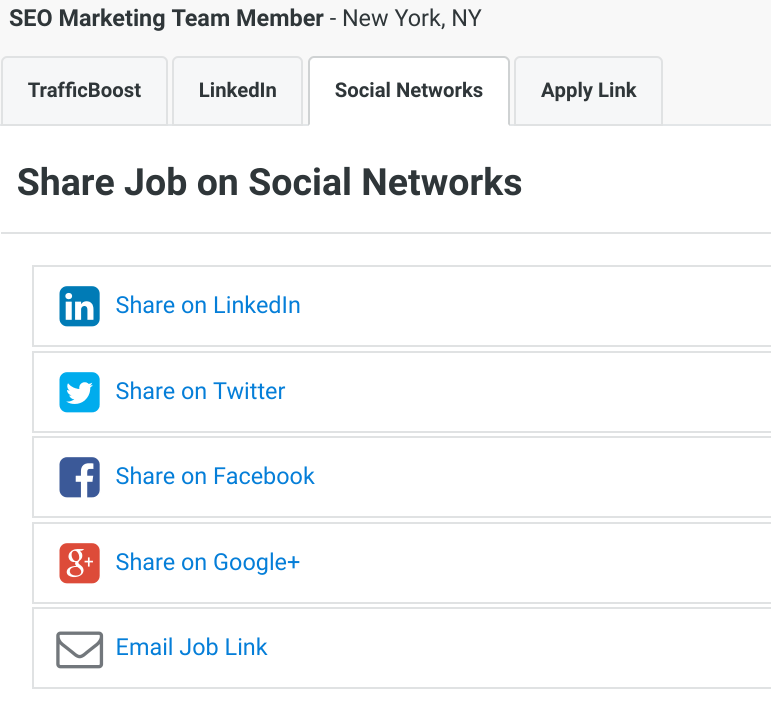 ZipRecruiter lets you share your job opening on your business social media accounts, like LinkedIn, Facebook, GooglePlus. Why not? The more people that see it, the more who might apply. There is no additional cost for this option. ZipRecruiter has a resume bank of over 12 million resumes. They give you unlimited resume views, but depending on your plan, you’ll be limited in the number of job seekers you can contact. Looking at and contacting job passive job seekers with active resumes is a great way to encourage qualified applicants to apply to your job. Below is an example of the email you receive once applicants start applying for your open job. This same data will also be available in a searchable format on ZipRecruiter. 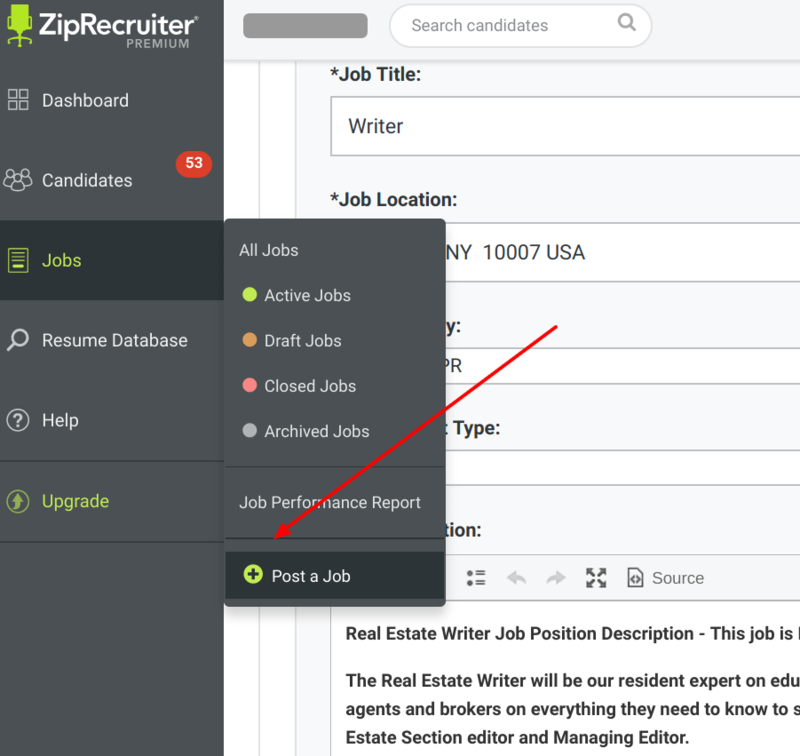 Here’s a view of how ZipRecruiter shows your job applicants within your account. You can even see applicants in the process of applying. Some options for viewing and contacting candidates are listed below. 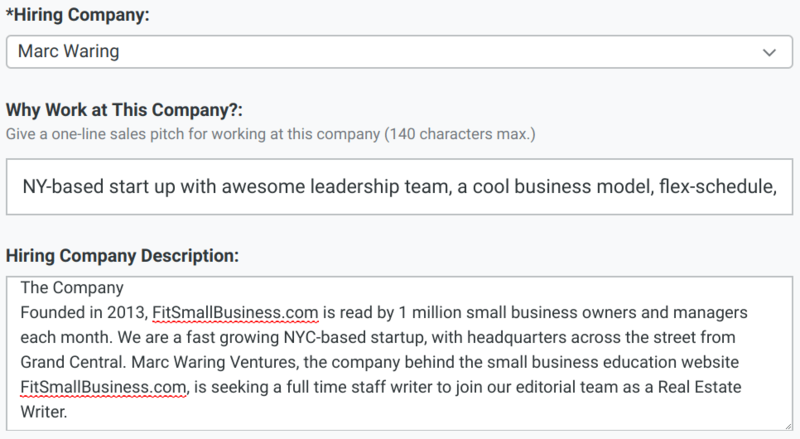 You can send emails to each candidate using ZipRecruiter’s templated auto reply messages, or if you want to customize your response, you can do that too. Responding to each applicant via email (even the ones you reject) is a great way to promote your employer brand, and feels more personal than a standard applicant rejection letter. If you opt for a paid account, you’ll get features similar to a full blown applicant tracking system to do things like: rate and sort your candidates, send them automated emails, and track them throughout the process. You can track the status of applicants from the get-go, such as: ‘reviewed,’ ‘rejected,’ ‘phone screen,’ ‘interview,’ ‘offer extended,’ ‘hired.’ There’s no need in invest in a separate applicant tracking system or maintain loads of applicant data on a spreadsheet. Although running a background check isn’t typically done until after a contingent job offer is made, you can do it right on ZipRecruiter through GoodHire, for an extra fee — priced between $29-$79 depending on the number of background checks you need. 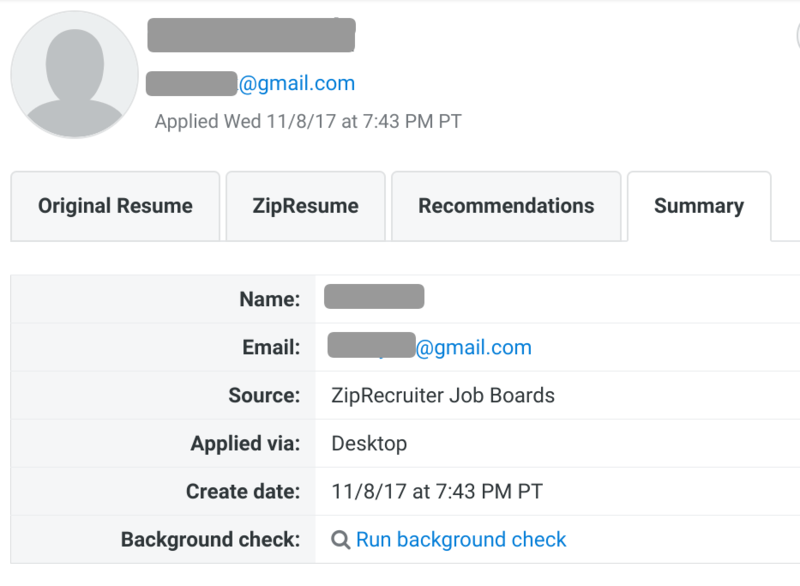 Zip Recruiter Screenshot showing option to run a background check! ZipRecruiter provides a Job Performance Report, so you can see how your job posts are doing. For example, in the two jobs we posted, we got plenty of candidates. But if your job posting doesn’t get many results, you may need to modify it by getting more specific on your description, paying extra to post the job on LinkedIn, or boosting traffic to your job ad. You’ll notice on this example, there were lots of applications, without having to pay extra to boost the post. For example, on the SEO marketing job, 20 people visited the post, and 16 applied. That’s 80%. Not bad. Had we chosen to boost the job, we could see the results of that extra spend on this same page. ZipRecruiter is a great time saving tool for employers that regularly recruit and don’t want to spend time posting to dozens of job boards. However, it isn’t perfect so we’ll share some of the downsides. 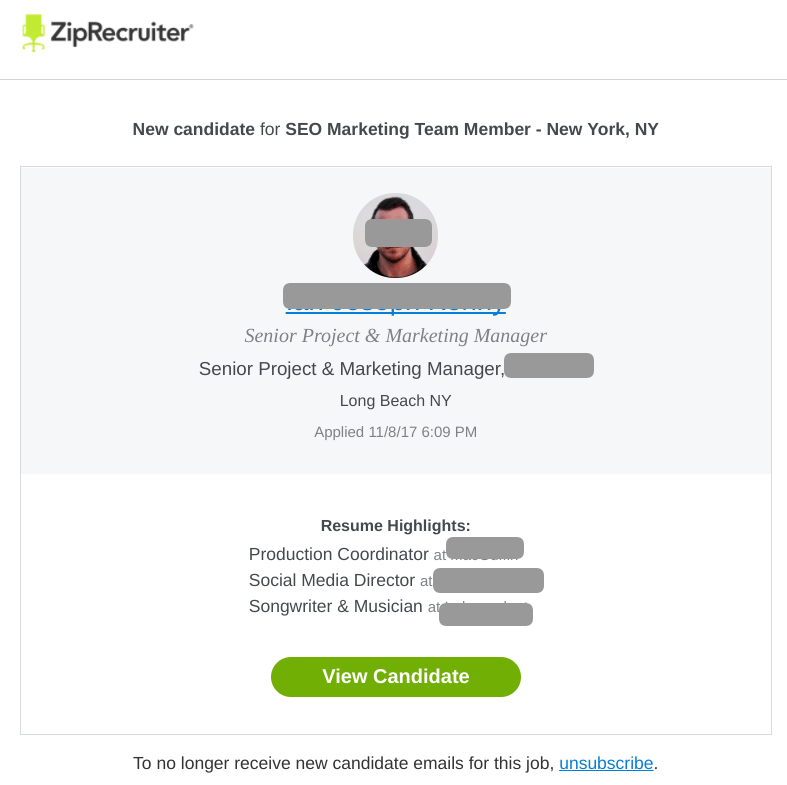 While there are hundreds of job posting sites that ZipRecruiter links to, there are fewer sites that aggregate job postings as a job search engine – searching for jobs, resumes, and applications across sites like ZipRecruiter does. Two other job search engines that aggregate jobs are SimplyHired, and LinkUp, although users have complained that sometimes jobs on those sites are out of date, and both have a smaller reach than ZipRecruiter. Otherwise you can choose to post your job on free job posting sites, use recruiting software or post directly on the #1 Job Site, Indeed. For a full summary of additional pros and cons, read ZipRecruiter reviews. If you’re looking for an all in one solution to source job candidates, post job openings, track the status of applicants, and give both you and your HR rep access, ZipRecruiter might be a good option for you. You can also post to other free job sites like Indeed and paid sites like Monster using Freshteam. 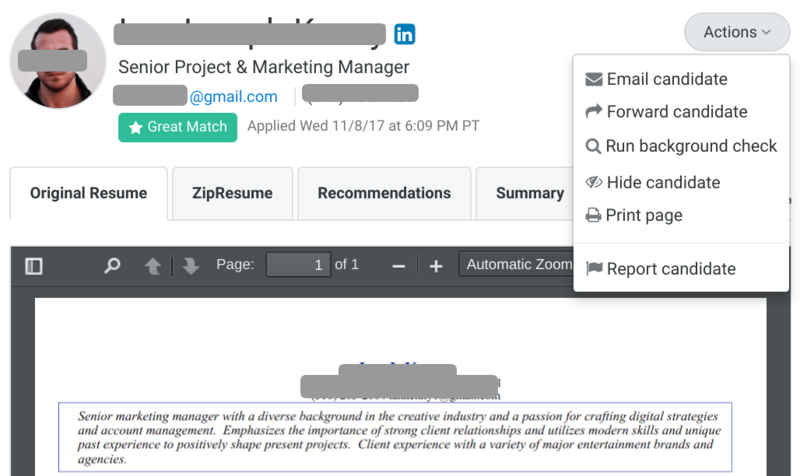 Freshteam lets you post to multiple job sites with one click and track which ones are sending you the best candidates. Click here to try it out. How do I put my resume on Zip Recruiter? 3) Upload your resume, or manually type it in. Hope that helps. Here’s the support page with screen shots!